So I want to start a new series called, "did you know you could", all about things, get this, that you can do but people didn't know. Mainly because I learn new things everyday about the beauty industry that I didn't know we could do. Like sleep in some conditioners. Hey, who would have thought? And since I'm all about sharing my insider knowledge, I'm happy to share these small tidbits of info as well. So...did you know you could dye your eyebrows? I've known this for a while, but I still talk to at least one person a week that didn't know you could. Or they imagine some awful black dye job when they asked for light brown. But I assure you, both are not true! You can in fact dye your eyebrows and not only that, they make special color just for them! I myself and partial to the auburn as I try to appear as ginger as possible. 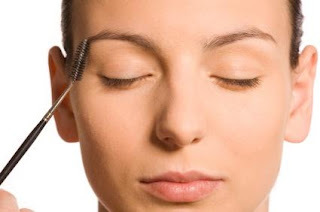 Brow tints are quick services, lasting only a couple of minutes. And most of the time it's around a $15-20 charge. You can't really beat that. Especially if you have blonde brows. Because then you just look like you don't have any. And well, that's not very fun. Ask your salon about brow tints today!